Pagers An extremely strong signal, just above the weather satellite band, blocked the TDA7000 and desensitized it noticeably. As these were pulse transmissions, random horizontal lineas appeared on the images. OrbComm On alternating lines, very regularly, new interference lines appeared. The alternating lines suggested 1 Hz signals. Through the internet, I found out that this interference was due to a new satellite constellation, dedicated to vehicle communications, from a firm called OrbComm. For unfatomable reasons, their frequencies are distributed right in the middle of the satellite band. To promote security (I'm guessing here), the OrbComm satellites regularly change frequencies. 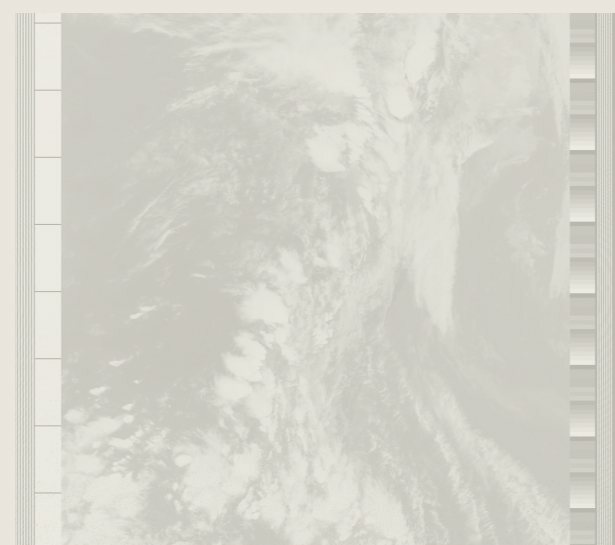 The standard transmission is at a quite low baud rate, but there is also a satellite (also variable) which actually transmits at a high rate, continuously, and this produces interference over the entire width of the image. 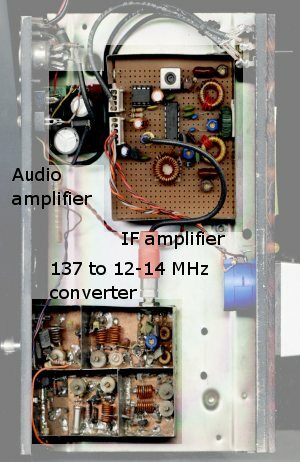 Audio amplifier: Inherited from the original receiver. It's just a simple 5W amplifier with a TDA2002 amplifier and provides ample audio level. IF amplifier: As usual, these modification projects initiate during the summer, when component accesibility dwindles to a minimum due to the holidays. The main problem was thus to make do with whatever came out of the junk box. A first try used an MC3359 (Wideband FSK receiver, which looked attractive because I had several of them). Linearity issues, some stability problems, and insufficient audio made me change. I detected an MC3361, salvaged from an old wireless phone, and from then on things improved. The selectivity was obtained using a rather critical filter, designed at an IF of 2 MHz to be able to implement the filter with toroids. As it is, the filter is very high-Q, used 3 coils, and provides a bandwidth of around 35 kHz. The filter is at the right of the board. The discriminator coil is modified from a 455 kHz standard version. It took some time to get it to work - I actually had to rewind it to get the Q I wanted. The MC3361 oscillator is used to move the signal from about 12 MHz to 2 MHz (voltage controlled), and this is the main tuning of the receiver. There a little space left at the bottom of the board to include some kind of sinthesizer circuit in the future. Input converter: This converter takes the 137 MHz signal, amplifies it somewhat, and then mixes it with a crystal oscillator signal, down to 12 MHz. This converter is also an inheritance from the original receiver.